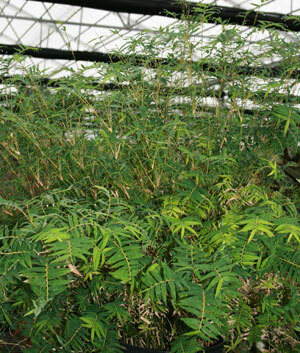 A clumping Bamboo with delicate fern-like foliage and small canes (1/3″ diameter) that weep for a graceful appearance. Chinese Goddess Bamboo can reach 6-10 feet in height and works well as a hedge or in containers. Once established this Bamboo proves to be very drought tolerant. Bambusa multiplex var. riviereorum is a great choice for a smaller landscape because of its size and non-invasive habit.